Our explosion-proof industrial gear units for II2GD and II3GD applications offer you the proven performance, durability and safety of our drives for potentially explosive atmospheres. For operators or original equipment manufacturers of machines or conveyor systems, it is essential that the drives they use are resilient, easy-to-maintain and reliable in operation. The industrial gear units of the X, MC and P series meet the requirements of the 94/9/EC European Directive for explosion protection, or as of April 20, 2016 of the EU Directive 2014/34/EU (ATEX) or ATEX95 in the European Union. Other European countries, such as Switzerland, have also adopted this regulation. We offer the reliable operation you need for your system in a wide variety of potentially explosive atmospheres to meet all the legal regulations and standards. Special measures are required for the operation of systems and machinery in areas with potentially explosive air/gas or air/dust mixtures. If formation of this kind of mixture cannot be prevented, specially protected gear units are required. Applicable standards and regulations govern the use of resources within existing hazard zones. 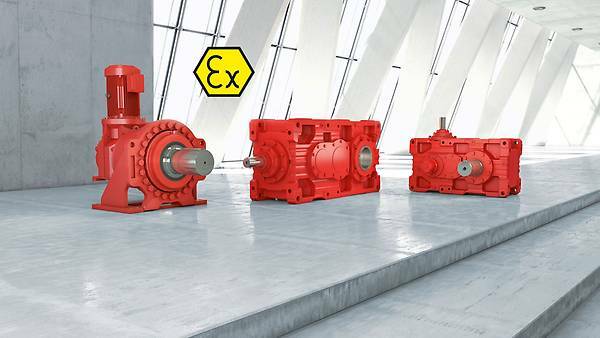 Our explosion-proof industrial gear units of the X, MC and P series meet the design requirements for group II, category 2G or 3G (potentially explosive gas atmospheres) and 2D or 3D (potentially explosive dust atmospheres). The gear units are suitable for use in zones 1 and 21 or zones 2 and 22. With SEW­EURODRIVE, you’re always on the safe side. The large number of predefined optional equipment for explosion-proof industrial gear units offers you optimal flexibility and safety. These include: motor adapters, backstops, sealing systems, shaft end pumps, mounting flanges and much more. This way, you can also implement explosion-proof applications with your industrial gear unit.